Seth MacFarlane is quickly losing his clout in the entertainment industry. “The Cleveland Show” has been cancelled, “American Dad” has been bumped from a major network to basic cable, he bombed as an Oscars host, and as for his last movie, “A Million Ways to Die in the West,” he was lucky there was a “Transformers” movie to soak up the title of Worst Movie of the Year. Now he’s returning to “Ted” as writer, director, and star to see if there’s any life left in that franchise. I’d say there wasn’t much life in it in the first place. The film once again follows sentient teddy bear Ted (MacFarlane) as he gets married to his girlfriend Tami-Lynn (Jessica Barth), tries to adopt a child to clear up their relationship troubles, and is forced to fight a court battle to prove that he’s a person and not a thing. He’s aided by his human best friend John (Mark Wahlberg), who pursues a relationship with Ted’s lawyer (Amanda Seyfried). The movie completely negates John’s relationship with the Mila Kunis character from the first movie, which seems like a heartless move at first, but turns out to be an upgrade as the game Seyfried character is much more likeable. The biggest problem with the film, as with the first, is that it relies too much on the novelty of a swearing, smoking, bad-mannered teddy bear to carry it to a nearly two-hour running time. Ted jokes fall into two categories: vulgarity for the sake of vulgarity, and unfunny deliberate jokes that, coming from a teddy bear, are supposed to be automatically punched up. There isn’t enough funny Ted material to carry a half-hour TV show, let alone a movie, and definitely not two. I wouldn’t even say that Ted alone is funny enough to carry a second one of those red band trailers that I watched over and over again with the first movie. Something I’ve noticed with MacFarlane’s projects is that he’s really bad at ending scenes, which badly affects the story’s pacing, and it’s apparent here too. Most of the scenes in this movie either trail off or end with a cheap laugh. “Family Guy” has a notoriously painful running gag about lazily ending scenes by abruptly cutting to Conway Twitty performances. The equivalent in this movie has to do with Google searches gone wrong. It’ s funny the first time, less funny the next few times, and then you actually look forward to it because at least it means the movie is finally about to move on. The movie does do some things right. I’ll bashfully admit that I laughed at a fight between Ted and Tami-Lynn and a detour involving Tom Brady. There are some left-field gags that work, like a surprise celebrity in a supermarket who wants to know how seriously Trix takes its “for kids” policy. What made me laugh the hardest was a climatic chase and fight sequence at a New York City venue where I once met Henry Winkler (he’s a great guy!). The only problem is that the sequence is over too quickly. All the scenes in this movie that drag on forever and the one I like feels rushed. It also left a bad taste in my mouth because it ends with a character making an important sacrifice, but it’s the wrong character. 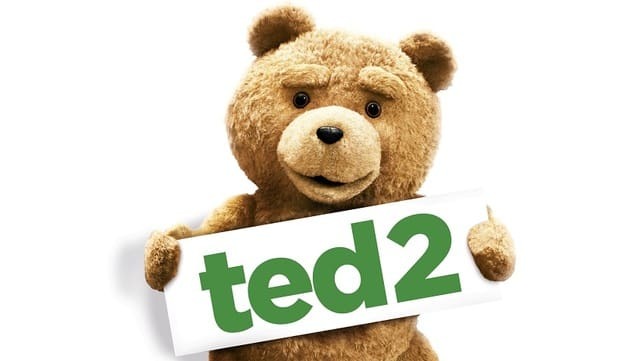 From what I’ve heard from other critics, “Ted 2” seems to have a spot already reserved in the Unfunny Comedy Sequel Hall of Fame. I actually think it’s funnier than the overrated original, but that’s in a strictly relative sense. If you only take two things away from this review, remember that I don’t think that the crude little teddy bear is funny for more than five minutes at a time and that Henry Winkler is awesome. He’s not in this movie, I’m just saying so on an unrelated note. “Ted 2” is rated R for crude and sexual content, pervasive language, and some drug use. Its running time is 115 minutes.